Sometimes I may seem a bit like a Tesla fan, but to be honest I am not a fan of any car brand. It's more that Tesla has stolen my heart a bit as a car lover, because it has proven that electric driving can be fun too. Not only the fast/insane/ludicrous acceleration, but also all technical features, such as autopilot. But anyway, the Tesla Model 3. After a long wait, following news and already seeing more than a year of deliveries in the US, it can finally be seen in the Netherlands. 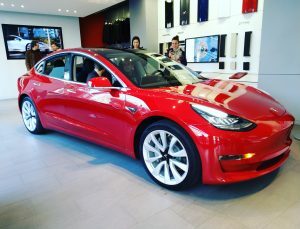 To be honest, I already saw the Model 3 in May this year, in the Tesla store in San Francisco, where I was also given the opportunity to take a seat. 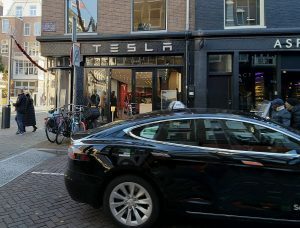 But now that this weekend it is also available for the first time in Amsterdam and Rotterdam, I couldn't resist driving to the Tesla Store at the PC Hooftstraat in Amsterdam. I live far in the east of the Netherlands, but I grew up in Zaandam and used to visit Amsterdam a lot. And I must say that I always feel very much at home there. The busyness, all the tourists, all sorts of things that are happening around you. The same goes for the traffic, I always like to move between the trams, cyclists, pedestrians, motorists and all the rarities in peace and quiet. Without accidents. 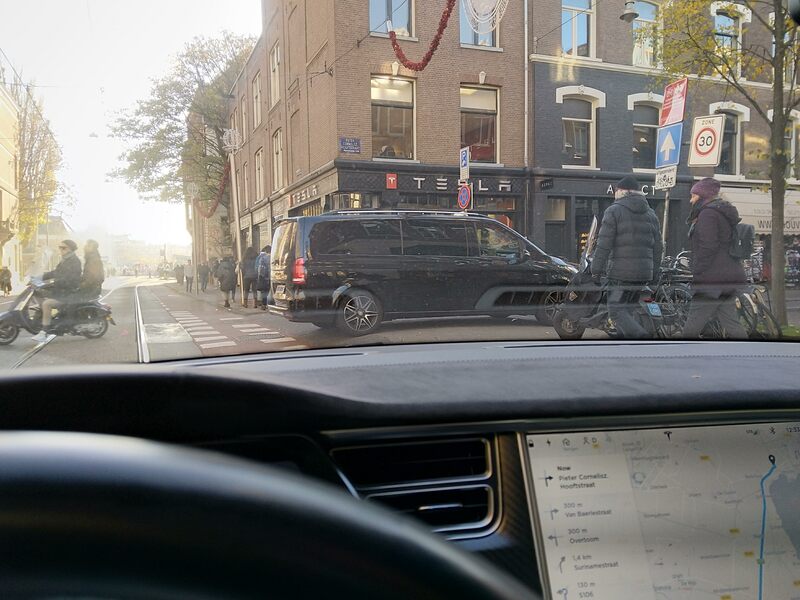 So driving through a narrow street near the PC Hooftstraat with all Tesla parking sensors almost in red, looking for a parking space, feels like my natural habitat. What I also love is that everyone in Amsterdam is so social. I was having trouble with the parking meter, the thing was just hanging in the payment process for more than a minute, and in the end it indicated that it had been cancelled. And so I had been fiddling for a few minutes. A taxi driver had seen that and came to me to help. He also asked some questions about the Tesla, for instance what I think of the car. He himself indicated that they also have Tesla's in their company, but the reliability is sometimes a bit poor. I said I recognize that a bit. It really is a great car, but there is occasionally a problem with it. And so you have another nice conversation. 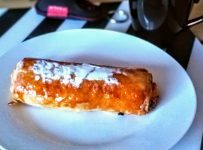 Something I really recognize from Amsterdam. So, arrived at the Tesla store. There was a row for reservation holders and a row for all regular visitors. Although I do have a Model S, I am not a reservation holder of the Model 3 and was placed in the normal row. But fortunately it didn't last much longer than the other row. After I have been waiting for about 15 minutes, they showed me and a few others the car, after which we could sit in it and get a few of the special Model 3 features explained. What was particularly striking was the enthusiasm and friendliness of the Tesla staff. 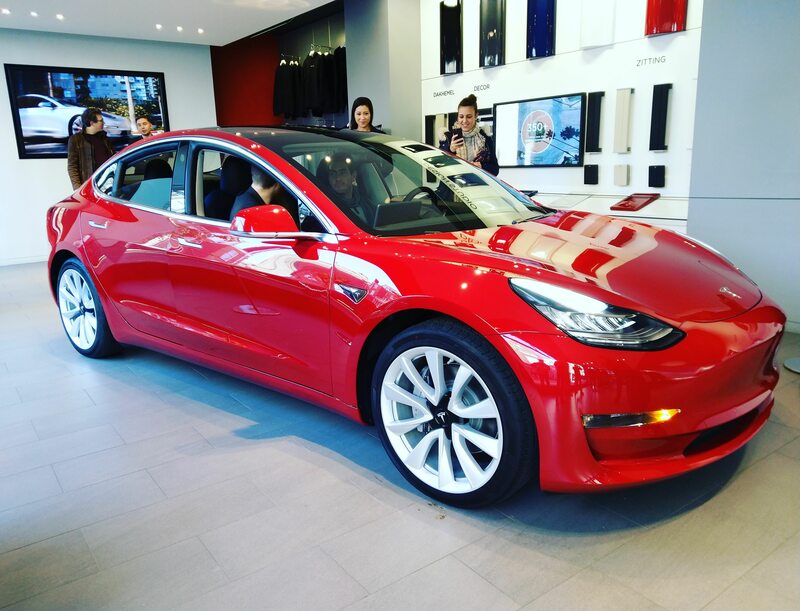 It is a coming and going of people who want to see the Model 3, but they remain extremely nice. And what also struck me is how many international visitors the car attracts. There were people from London and France for example. The Tesla Model 3 remains a very beautiful car to me. 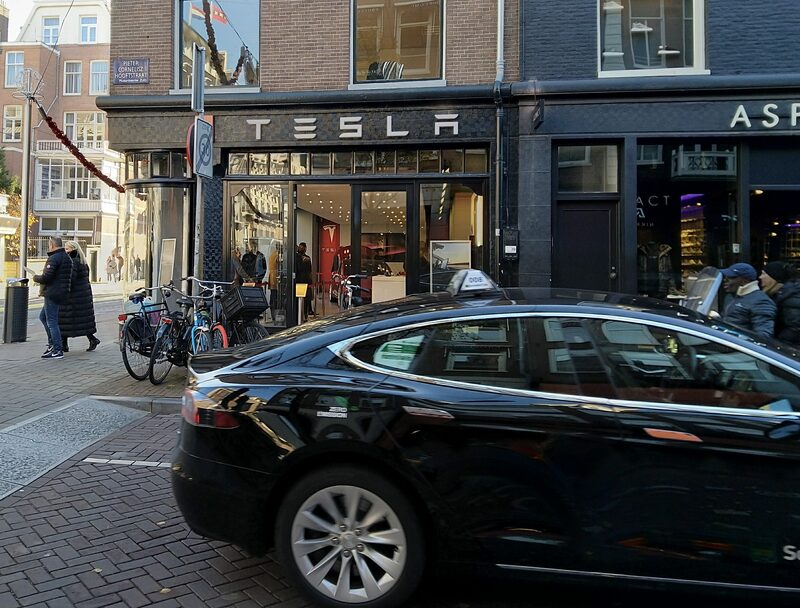 In Amsterdam they had the red model. 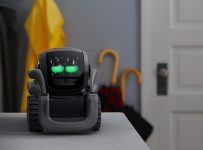 It was an American version by the way, it also had the American charge port. In real life the car is much nicer than on pictures. I can't do it myself to take a picture that really does the car justice. I am also quite enthusiastic about the car. Unfortunately I've never been allowed to drive it yet, but when I read the reviews, everyone is very positive about the handling. The handling of the Model S is not bad, but the Model 3 seems to feel really sporty. Before Tesla I drove Alfa Romeo, so that sportiness is really something that suits me. I hope to have a Model 3 Performance one day. But I don't know if I really would spend the money for it in the end. Although it is cheaper than the Model S, there are so many interesting electric cars nowadays. Also less expensive ones, like the Hyundai Ioniq Electric. Maybe it lacks the thrill of a Tesla, but it also drives much cheaper. 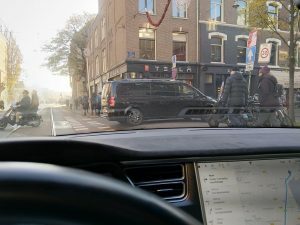 All in all it was very cool to have seen the Model 3 in Amsterdam, although the experience was a bit short (but everyone wants to touch it of course). 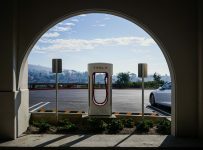 So I decided to make it into a Tesla day and to continue my way through a few Tesla Superchargers. 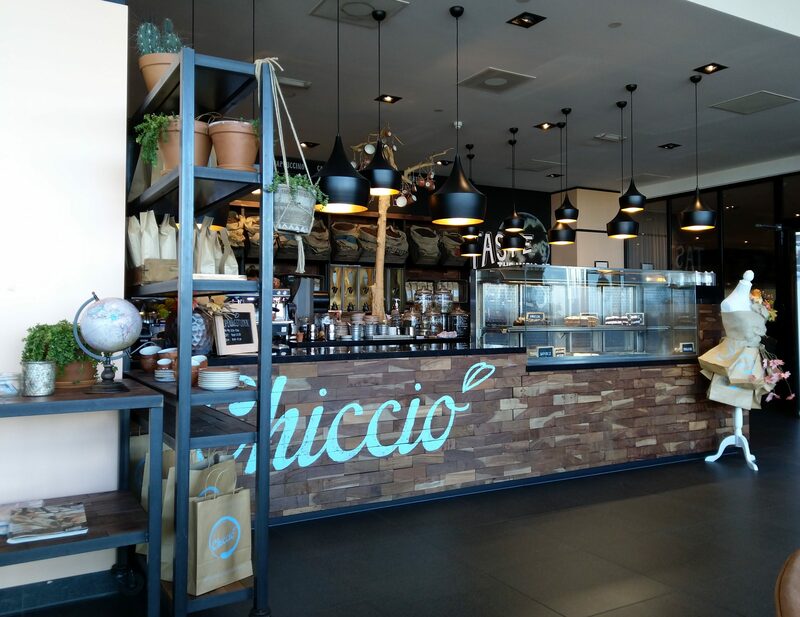 In Hoorn I had a coffee at a very cozy looking coffee bar (also very nice people who work there) and I visited the McDonald's somewhere. If you make such journeys you will notice how enjoyable it is to drive a Tesla. The peace and quietness of the car makes driving a really relaxing experience. To conclude, I can only recommend that you take a look at the Model 3 in real life to get a good idea of it. And is driving in a Tesla, but also driving electric in general, really pleasant. If this is the future of driving, you won't hear me complain.